After booting up your computer, with factory installed Vista for the first time, be sure to create a set of recovery discs of the full factory image. 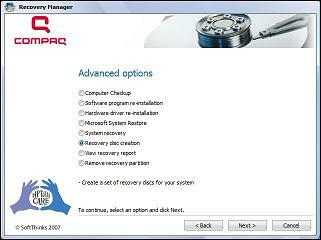 The recovery discs are used to start up (boot) the computer and recover the operating system and software to factory settings in case of system instability or failure. While the steps listed here are for a Compaq PC with Windows Vista, different manufacturers have slightly different instructions and these will give you a general overview of the process. 1. Click Start | All Programs | Recovery Manager. 2. Select Recovery Manager. This will open Recovery Manager. 3. Click Advanced Options. If you are using a laptop and operating on battery power alone you must connect to an AC power outlet before you can go to the next step. 4. Select Recovery disc creation. Click Next. 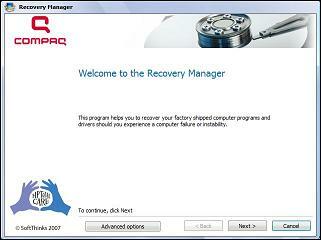 The Recovery Manager will begin creating the necessary files. This may take a while, so be patient until the bar has reached 100%. 5. Read the table of requirements that appears. Depending on the type of discs you use, more or less may be needed; if you use ordinary CDs, Recovery Manager will require more compared to fewer discs if DVDs are used.